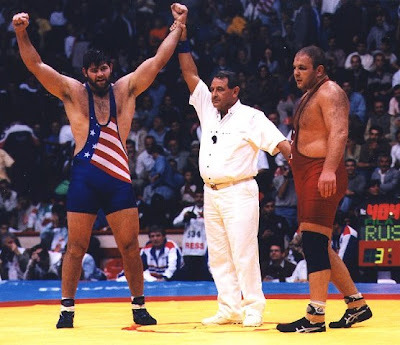 -Stephen Neal won a free-style wrestling world title in 1999. He began his N.F.L. bid in 2001 and is now the starting right guard for the Patriots. FOXBORO, Mass., Jan. 20 - Stephen Neal is an offensive lineman for the New England Patriots, but he is more likely to be recognized on the streets of Iran than he is in Boston. In wrestling circles outside the United States, the 6-foot 4-inch, 305-pound Neal is known for his exploits in that sport: being ranked as the world's No. 1 wrestler in 1999, winning two N.C.A.A. titles for Cal State-Bakersfield and competing everywhere from Bulgaria to Colombia. For Neal, wrestling was not Vince McMahon's W.W.E. world of mayhem. It was one of long training hours and little local recognition. But a phone call in the spring of 2001 changed his life just when he was itching for something more. At the recommendation of a former Olympic wrestler, Matt Ghaffari, Neal called Neil Cornrich, a sports agent based in Cleveland. "My name is Steve Neal," he said, introducing himself to Cornrich, "and I want to play pro football." That call began his improbable journey from the wrestling mats to the football field, a transformation that even the hardly effusive Bill Belichick, the Patriots' coach, described as "a wonderful story." When he took his shot at the N.F.L., Neal had last played football at San Diego High School in the early 1990's. But he has established himself as a starter in his fourth N.F.L. season and will be planted at right guard when the Patriots meet the Steelers in the American Football Conference championship game Sunday in Pittsburgh. That he has gone so far, so fast, is a testament to his hard work and to the ability of Patriots coaches to spot and develop the rawest of talents. "It's a miracle," said Neal's mother, Illys. "But at the same time, knowing Stephen, I'm not shocked." Cornrich did not immediately recognize Neal's name when he called that day in 2001, but he soon realized he had seen Neal in action, winning an N.C.A.A. wrestling title in 1998. Cornrich, a self-proclaimed wrestling buff, said he was struck by Neal's strength and physique and curious about whether he might have the capability to make it in the N.F.L. Three years later, here was Neal reaching out to him for exactly that purpose. A day or two after the call, Ghaffari dropped off Neal at Cornrich's home. The next day, at 5 a.m., Cornrich drove Neal from Cleveland to Columbus to work out with Dave Kennedy, then the strength coach at Ohio State. Kennedy knew size would not be an issue for Neal. The X-factor that Kennedy needed to measure was Neal's burst, or the suddenness in which he was able to accelerate. After five minutes, Kennedy looked at Cornrich and said, "We've got something." "You can teach football, but you can't teach ability," said Kennedy, who is now the strength coach at Nebraska. Meanwhile, Cornrich had persuaded Belichick, his longtime friend, to give Neal a tryout. At first, Belichick balked, sarcastically asking Cornrich if he was trying to take over Scott Pioli's job as vice president of player personnel. But after Kennedy's seal of approval and two weeks of intense preparation, including learning the agility drills the Patriots use and the proper way to line up for the 40-yard dash, Neal got his tryout. Light on knowledge but loaded with potential, Neal passed his test and signed a free-agent contract. He went from being one of the best in the world in one sport to what he called a "project guy" in another. He told himself to open his ears "and not have any pride and try to learn." But it was hardly easy. Belichick initially tried him on defense, a decision he called stupid, before switching him to the offensive line. That spurred Neal's long climb to his current job. "When I tell you he didn't know where the field was, he didn't know where the field was," Belichick said. "He didn't know how to put his pads on. He didn't know where to line up. He didn't even know where to go in the huddle. When I say starting from scratch, we're starting from below scratch." Neal's attempts at napping during training camp summed up his struggles. "I was lying in bed trying to get a nap, and all I could think of was 64 protection and thinking of all the possibilities, and my head is spinning," he said. The Patriots cut Neal in August of that first season. The Philadelphia Eagles picked him up for their practice squad before the Patriots took him back and put him on theirs. Neal was on the sideline as New England upset St. Louis in the Super Bowl in February 2002, and he earned his way into the starting lineup the next season. But an arm injury in his first career start, in October 2002, kept him out for the rest of that season and for 2003. This season, Neal battled his way back into the starting lineup in Week 2 and has stayed there. He has impressed his teammates with his ability and his humility, and has blended seamlessly into the Patriots' locker room. "He lines up next to me on field goals, and I've seen him drop someone, then pick him up and say that he's sorry," said Lonnie Paxton, the Patriots' long snapper. "He's just a genuinely nice guy." Neal has two rings to show for the Patriots' Super Bowl victories in the past three seasons, although he did not play in either game. But if the Patriots beat the Steelers on Sunday, Neal's climb will be complete. His next game will have Roman numerals attached to it. "I always wanted to play football," Neal said. "I was very fortunate to get in the right place at the right time."